Referee(s) are usually in a better position to see the action, the offside line, etc. Referee(s) usually know the Laws of the Game better than coaches and parents. Many judgments are “in the opinion of the referee”. You are entitled to a different opinion but Law 5 makes it abundantly clear that only the referee’s opinion matters. Finally, referees are only human, and volunteers. Even FIFA World Cup referees don’t see everything. Referee(s) have enough to keep track of as it is, with 14 or 18 or 22 players on the field; they don’t need coaches and parents yelling at them too. If you’re driving on the freeway in heavy traffic, does it help if all the passengers are yelling at you? Here are some of the most common ways in which parents and coaches often get it wrong. Hey ref, how is that (not) offside? When parents and coaches disagree with an offside (non-)call, they usually miss the timing and/or the angle. 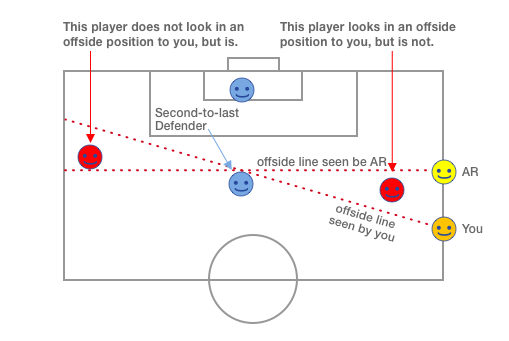 Timing: offside involves two points in time: 1) when the ball is played by a teammate, and 2) when the offside player becomes involved in active play. The AR flags at time 2), but the player was in offside position at time 1). When the AR flags, there may be no player in offside position. This is particularly hard to spot on a through ball, when there is more time and distance between the ball being played and the player being involved. Angle: the AR is on the offside line, the only place from which to judge offside accurately. It’s hard: even the world’s best referees get the offside call wrong about 1 in 4 times. Ask yourself: do you know exactly where each player was when the ball was played? Handling the ball is only a foul if it is deliberate, in the opinion of the referee. If the referee does not whistle, s/he has decided that the player had no time to move his/her hand out of the way, and that the hand was in a natural position. It does not matter whether the player gained advantage from the handling. Most cases of handling are not fouls. Hey ref, how is that (not) a foul? Physical contact involving kicking, charging, tackling, etc., is a foul if, in the opinion of the referee, it was careless, reckless, or using excessive force. If a player gets the ball first, but then kicks the opponent in a careless manner, it’s still a foul. The referee will let play continue for contact that is trifling or doubtful. You may disagree with the referee, but Law 12 makes it clear that this a judgment call, not an absolute standard. Just because a player ends up on the ground doesn’t mean a foul was committed. If two players come charging at each other to get to the ball, and one or both go down, it’s not a foul if they were trying to play the ball and not each other, and were not careless or worse. Hey ref, that’s our ball! When the ball goes out of bounds, the referee has to decide who last touched it. You may think an opponent touched it last, but maybe the ball was already out. The ball has to completely cross the line to be out (or to be a goal). If the ball touches the ground outside the line but part of the ball is still above the line, it is still in play. Hey ref, that’s a bad throw-in! Law 15 does not require a throw-in to be elegant. It can be ugly, the ball can spin, the ball can drop in front of the player, as long as both feet touch the ground, on or behind the touchline, and the ball comes from behind the head and is released above the head. Moreover, minor violations are usually trifling, and many advanced referees will let play continue. It’s soccer, not a throw-in beauty contest. How often has a referee changed a call because you yelled at him/her? Probably never. The only effect is that the players are now focusing more on the referee than on the game, everyone enjoys the game less, and less people volunteer to be referees in the first place. Many thanks to our esteemed Referee, Charles Corbett, for coming up with this helpful document.